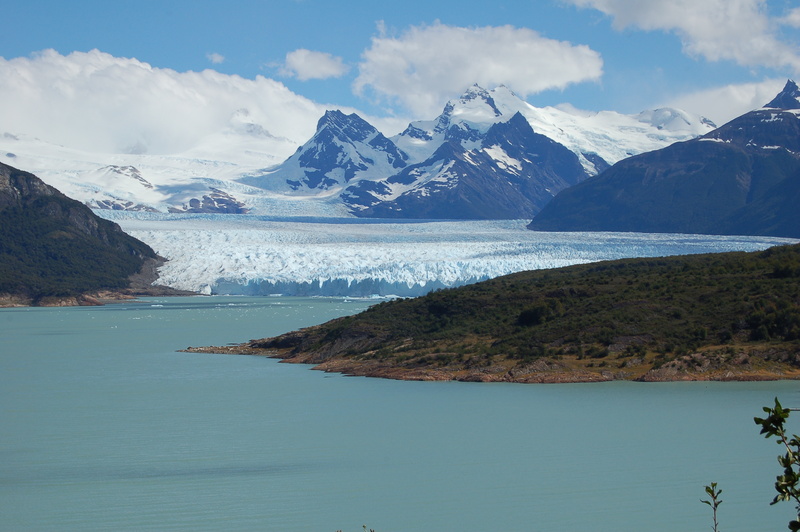 During the ice ages, the planet was a lot dustier, and the wind-swept plains of Patagonia may have provided much of the dust that we now find in Antarctica. From where exactly did that dust originate? Could it have influenced climate? And did it help trigger past ice ages? A team of scientists recently spent 10 days collecting dust in Patagonia to find out. 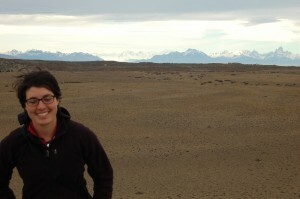 Alejandra Borunda, a student in Columbia’s Earth and Environmental Science Journalism program, kept this blog during her travels and is now working with scientists Gisela Winckler and Michael Kaplan of Lamont-Doherty Earth Observatory to analyze their samples. The Perito Moreno glacier is constantly groaning and cracking as it calves off tiny chunks of itself. Credit: Ale Borunda. 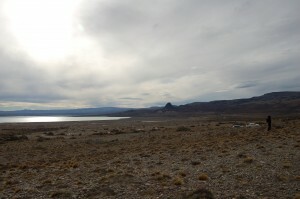 Mike and I head out today for Cerro Gorra, leaving Jay and Barbara at Lago Cardiel to finish the stratigraphy. What wonderful people; I am so grateful to have had the opportunity to do field work with them. 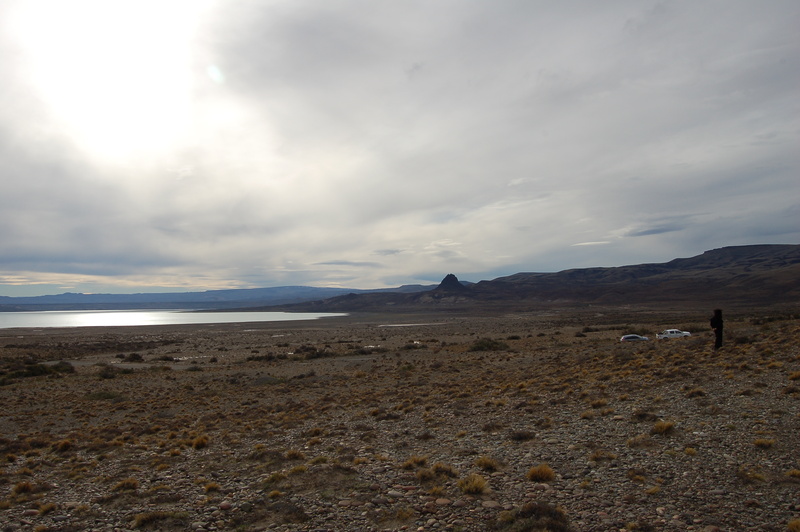 We drive to Lago Argentino, where Mike is meeting a new research team for a separate project. We have just enough time to stop at the Perito Moreno glacier in Los Glaciares National Park. The only glaciers I’ve seen before have been quiet and still but this one cracks and grumbles as we watch. The sound of breaking ice echoes through the valley; the noise seems outsized for the quantity of ice. 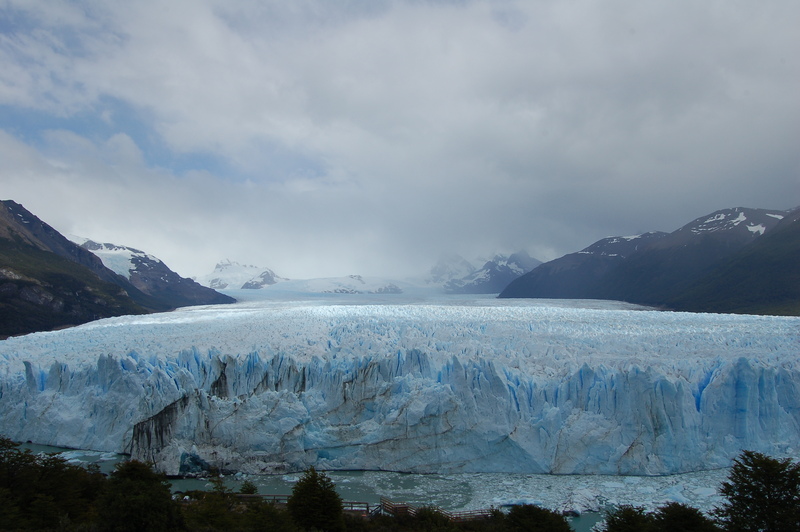 I still can’t imagine how ice like this once coursed through valleys to blanket huge parts of Patagonia. The glacier I’m looking at is enormous; a tourist boat near its base looks like a wind-up-toy. I’m trying to comprehend how much snow would be needed to make this glacier grow thicker and hundreds of miles longer. It’s a lot easier to understand how a glacier can grind up mountains to make dust. Anyway, I’m back in Rio Gallegos safe and sound. Tomorrow I return our rental car and get back on a plane for Buenos Aires and then New York. Mike has our samples in a bag; he’s going to FedEx them back to the States in a cardboard box. Hopefully they’ll arrive intact. This has been an incredible field experience, and I’m incredibly thankful to Gisela and Mike for arranging the trip. I hope we get some good data! Rio Bayo. Credit: Ale Borunda. Last night I made dinner. I’ve never cooked over an open fire—only on a tiny gas-powered stove on backpacking trips–but Jay and Barbara have been teaching me how. Dinner was edible. Jay built the fire last night, but tonight I’m hoping to do the whole thing start to finish. Wish me luck. We left Cerro Gorra this morning after spending all of yesterday taking dust samples and studying the Cerro’s stratigraphy. We were looking for ancient dust stuck in lake sediments. Dust floating in the air falls onto the lake and sinks to the bottom, where it gets trapped in mud. Normally, we’d have to drill a core into the bottom of the lake to get at these sediments, but drilling takes time and money. Lucky for us, the local climate and geology let us sample these sediments without drilling. 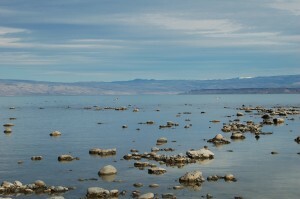 The lake’s water level has fallen over the last 20,000 years, leaving its ancient bottom sediments exposed. When a stream cuts through the layers of sediment, you can see the whole depositional record of the lake. We stood in the stream bed looking at its banks, and the layers of sediment deposited as the lake waxed and waned. “Look,” says Jay, pointing to cobble layer between the sediments, “There’s an old shoreline with shells in it!” A few inches above the cobble layer was a layer of organic material. We hacked out chunks of sediment from those layers with our trowels and stuck them in Ziploc bags. Jay added shells from the layers to date their age. 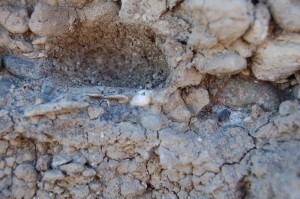 Once the shells are dated, we can estimate the age of the sediments. Now we continue to the other side of the lake, stopping at Rio Bayo, on the north shore. 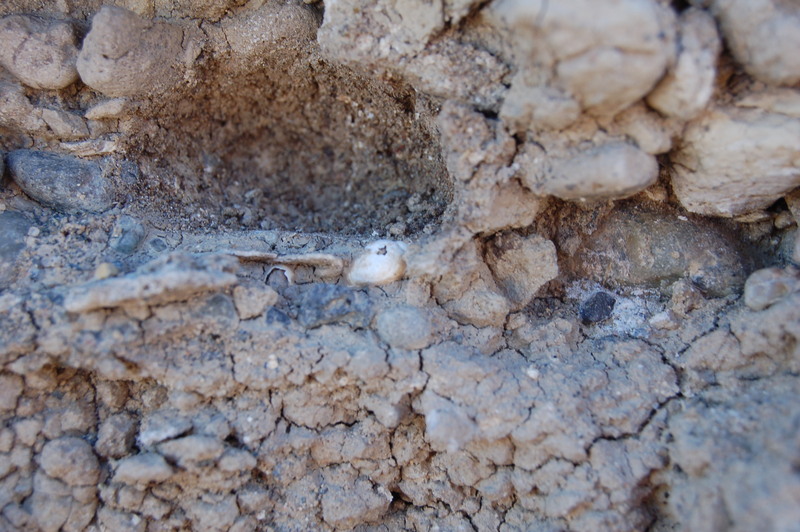 We’re just about to move on to another area with better stratigraphy when we spot shells with brownish-green markings, different from the white shells we’ve been seeing for days. Finding pigmented shells comes as a surprise, though it shouldn’t since not all shells are bleached white once the organism inside dies. Pigmented shells. Credit: Ale Borunda. This trip reminds me how easy it is to see what you want to see. Looking more closely at a shell or shoreline is how science advances, but learning to be this observant is incredibly difficult. Wandering along the shore, we search for anything of interest. Credit: Ale Borunda. 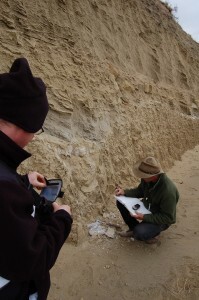 Reconstructing a shoreline history takes skill. Today we’re using altimeters to establish the elevation of Lago Cardiel’s former shorelines. We also continue to look for shells to help us date the lake’s past shorelines, a task that requires strong powers of observation. In one short stretch there might be a dime-sized snail shell almost indistinguishable from the millions of white, rounded pebbles on this ancient beach. 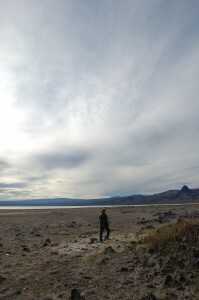 A few meters away, we might have to readjust our eyes to search for tufa, or smoothed glass fragments (people left bottles on the shore, which wore down like sea glass). Most often, we don’t know what we’re looking for, so we shuffle around looking staring at our feet as if trying to find a lost contact lens. Barbara, Jay’s wife, is a master at finding stuff. She spotted a piece of nacre—the shiny part of an oyster shell–about the size of a quarter. I have no idea how she picked it out from the grayish-blue rocks around it. The fragment must have come from a pretty big oyster. Could giant freshwater oysters once have lived here? As the hunt continues, Mike finds an oyster chunk as long as a stick of gum, and I discover a saucer-sized fragment, and another, the size of my palm. An ancient oyster shell fragment as thick as two knuckles and as big as my palm. Credit: Ale Borunda. What are these things? I picture a filter feeder big enough to eat a flamingo. With each fragment we find, it becomes obvious that these oysters probably originated from the sea. Jay says we’re on the edge of a drainage delta, so these oyster fragments may have been carried downstream from their fossil beds and deposited here. 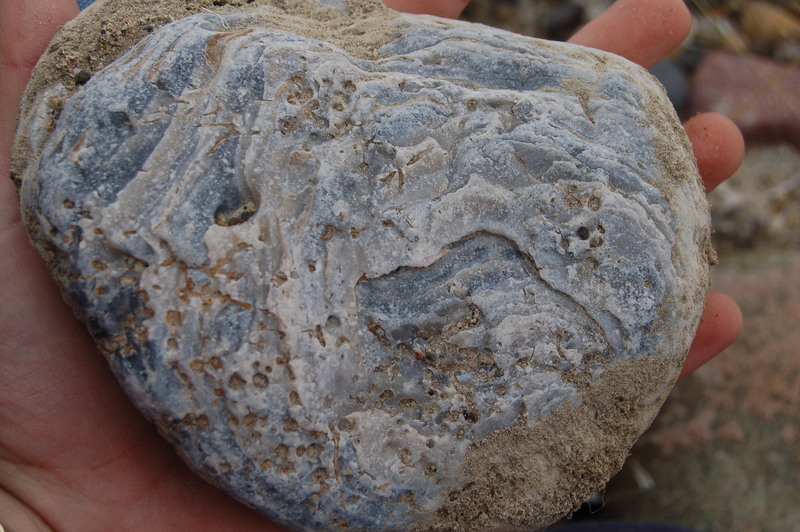 These bivalves also appear to be ancient. Mike remembers finding similar oysters several years ago near a rock outcropping at least as old as the Miocene, the geological period that spanned from 23 to 5 million years ago. Such is the nature of fieldwork: a constant gathering, synthesizing and imagining of information. How can I build a story about this place that incorporates all of the latest clues? We found no snails in the shallow water around these rocks. Maybe the flamingos know where to find living things? Credit: Ale Borunda. Today we’re looking for live snails so that we can measure how much carbon-14 they are incorporating into their calcite shells. Carbon-14 is a rare isotope of carbon that decays radioactively–organisms incorporate carbon-14 into their tissues and shells while they are alive, and as soon as they die, the carbon-14 starts decaying away. We can estimate how much carbon-14 there should have been in a shell, for instance, when the organism died, and we can measure how much is left: the difference tells us how long the shell has had to decay its carbon-14 away. Different organisms incorporate carbon differently, though, and it’s useful to get a modern sample (e.g. one that is alive, using carbon, when we find it) to compare to the older samples we find. The air is hot and still and the tufa coating on the rocks around us reflecs the sunlight, making the day feel hotter and brighter. We stalk snails in tiny inlets and pools, sifting through pebbles and combing through thick algae that will eventually decompose into tufa. We squat by the side of the lake for at least an hour but don’t see any signs of life, not even zooplankton. We can see flamingoes standing in the water at a distance, and other birds wheeling in the sky but what are they eating? Perhaps there are fish somewhere in this giant lake, but at its shoreline, all I can see is algae. Later on, in the afternoon, we explore a stream cut that Jay had noticed, called Cerro Gorra. The stream had cut cleanly through former lake shores, leaving beautiful stratigraphic sections. We will spend time here in the next few days studying the layers and looking for shells. Lago Cardiel is much larger than I expected; we can barely see the opposite shore. This side is ringed by low hills and opens up like an apron, broad and gently sloping. As soon as we come through the hills, we notice well-defined former shorelines, which look like soap residue rings around a bathtub. Shorelines make great natural roads, just as glacial outwash fields are apparently well-suited for airport runways because they are flat and drain well. JFK is built on a glacial outwash plain, Mike tells me. We drive along until we spot an outcropping of basalt rock and carbonate tufa. Littered over this surface are the tiny white shells of dead snails which once lived near the shore. Their presence indicates that the lake shoreline must have been this high at some point. The shells must have been left when the lake receded. An old snail shell that was embedded in the old shoreline, in a layer of dark beach cobbles. Above the shell is the newer shoreline. Credit: Ale Borunda. The lake has grown and shrunk many times over the past 20,000 years. When it grows, it leaves behind a “bathtub ring” of residue around its edge: pebbles smoothed by wave action, carbonate tufas, the remnants of the things that lived at the shore. There are at least three distinct bathtub rings (each of which represents a time when the lake surface was higher than it is today) that we can see in a Google Maps printout we’ve been carrying around. But Scott Stine, a researcher who did his Ph.D thesis on Lago Cardiel, has identified other shorelines beyond the three we can see now. If Jay could travel back in time, he would be standing shin-deep in lake water. Credit: Ale Borunda. To date these shorelines, Stine used the carbon-14 dating method on organic material linked to various shorelines to determine their age. His data suggested that the highest shorelines occurred about 10,000 years ago, at a time when the rest of South America was hot and dry. 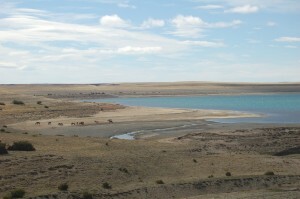 That would mean that this lake got really, really huge, mainly because of rainfall. Jay and Mike are unsure this happened, and think that instead the high shorelines may be older than everyone thinks. 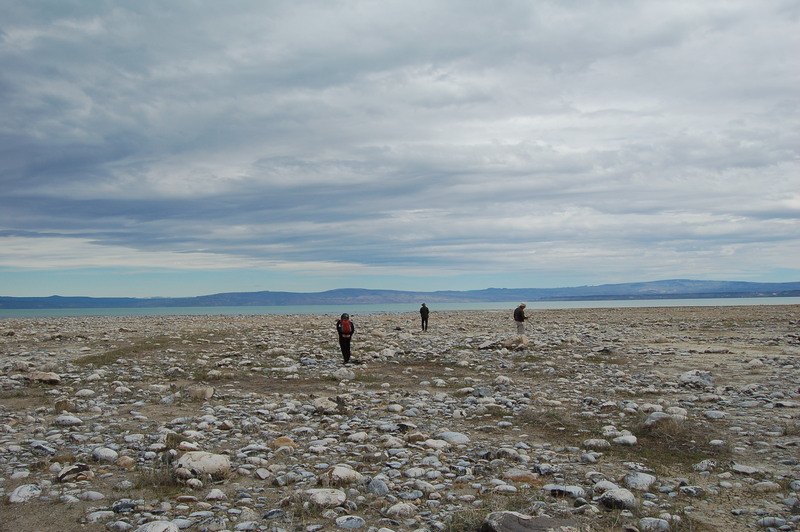 Maybe the lake was big about 20,000 years ago—the peak of the last ice age? Dating the shells and tufas again may resolve this question. 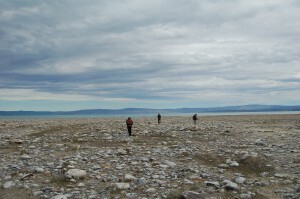 So we’re looking for the highest shorelines, which is trickier than it might seem. We also have to find good material to date. 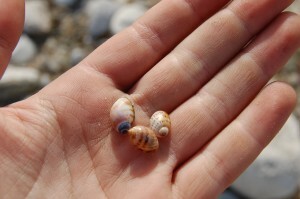 That’s why Jay nearly jumped up and down with glee when we started finding shells. They’re great for doing carbon-14 analysis since we know the fossils once lived in the former lake. Jay and Mike call out questions as they search. Maybe this is the 55 meter shoreline? 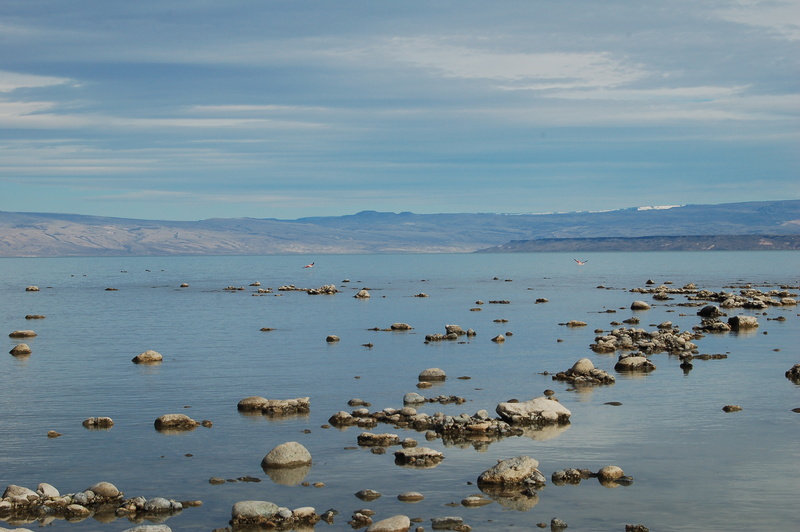 Are there other calcifying organisms that lived in the lake? For most of our drive, I stare out the window and ask Mike questions: “Is that a glacial moraine?” and “How tall were the Andes originally?” and “Why are those sediments white?” He can respond to a stunning number of these questions. I love being around field geologists; the way they make sense out of visual clues that most of us overlook is both mysterious and fascinating. 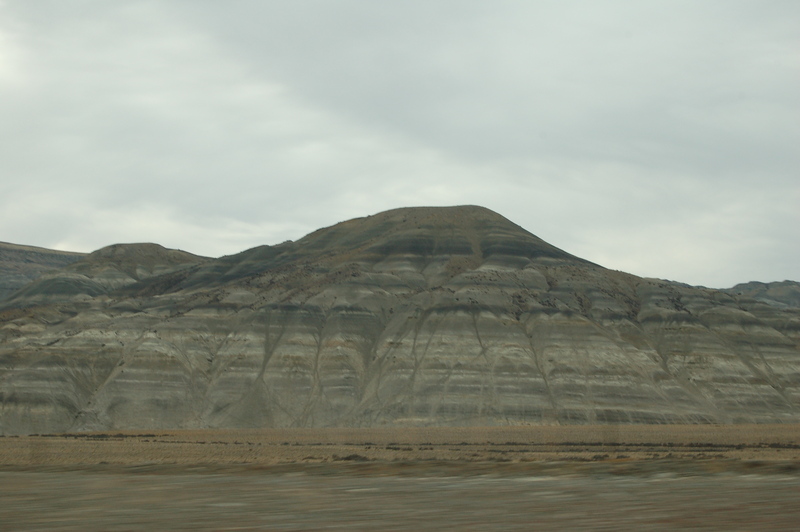 We drive through a wide, deep canyon, with clearly exposed sedimentary sequences. “What are those dark layers?” I ask, and Mike explains that we’re driving through a Cretaceous sedimentary sequence. Some layers may be siltstone or shale-like deposits laid down when this area was submerged under a shallow sea. Suddenly, Jay, who is driving ahead of us, stops his truck by the side of the canyon. “I just had to check this out,” he says, pulling his rock hammer out of the truck bed. “Look at this place!” Those dark layers are paleosols, or old layers of organic-rich soils preserved under other sediment, he tells us. And there’s siltstone, he points out. Barbara, his wife, tells us that they’ve found tons of fossils in similar siltstone beds on former trips. A little further on we see thick, wind-deposited sand beds marked by a layer of volcanic tuff. The sand beds look like the beds forming at the surface today. I don’t know how strong the winds were when those beds were formed or how much sand and dust was in the air but the process that created them is the same that makes sand dunes today. There may have been dinosaurs stomping around and wildly different plants waving in the stiff breezes. But the winds picked up dust particles in the same way they do today. Biology tries out new body plans, reproductive systems and behaviors, and through it all, geology marches forward. Exposed Cretaceous beds near Lago Argentino. Credit: Ale Borunda. Searching for Lago Potrok Aike with the help of GPS. Credit: Ale Borunda. Jay and Barbara took off this morning in a rugged-looking truck while Mike and I followed in a Honda CR-V that looks more appropriate for Route 9W than Patagonia’s gravel roads. We’re hopeful that nothing terrible will go wrong. Wish us luck! I was totally entranced by the geomorphology of this place: I must have taken 100 photos through the car windows. Everything is so flat! Even when there are basalt plateaus, they were flat on top. The view reminded me of Eastern Oregon, with its wide plateaus, basalt outcrops and gentle, sloping remains of braided rivers. After a few hours of driving we pulled off the main road, towards Potrok Aike (“Aike” means “place” in Tehuelche, the native language of Patagonians). We didn’t know exactly where the lake was, but Jay had scoped the area out on Google Earth and plugged the lake’s coordinates into his GPS. On Google Earth, it looked as if a small road passed close to the lake. We found it. Lago Potrok Aike. Credit: Ale Borunda. I hadn’t realized how lucky we are in the U.S. to have reliable, highly-detailed topographic maps in most places. Apparently, in Potrok Aike and other places in Argentina, the maps are not as detailed or up to date. So, why am I here, clunking down gravel roads and scrambling through dust? Yesterday I explained what Mike and Jay are doing. I am along for the ride, hoping to collect dust samples laid down during times in the past when the climate was different. My master’s project at Lamont, with my advisors Gisela Winckler and Mike Kaplan, is about dust deposition in Antarctica through different climatic stages. The dust that drifted down to Antarctica at the peak of the last ice age appears to have come from southern South America, while the dust that arrives in Antarctica during warmer times, such as the last 10,000 years, seems to come from elsewhere. There was also a lot more dust deposited during the last ice age and earlier glacial periods. I’m going to be analyzing geochemical isotopes found in dust collected in Patagonia and Australia to see if those samples match the dust found in ice cores from Antarctica. So that’s why I’m here, to find out if ancient dust collected in Patagonia is similar to dust found thousands of miles away, from thousands of years ago. 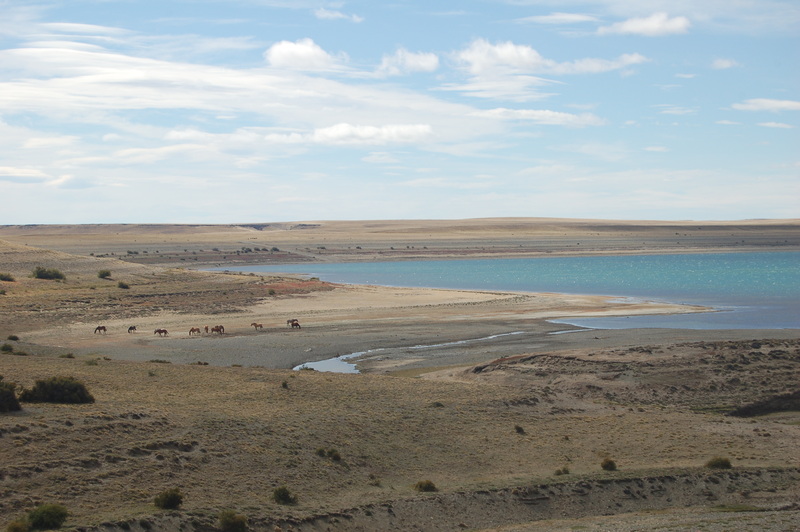 This will help us understand how the climate of the Southern Hemisphere worked in the past. 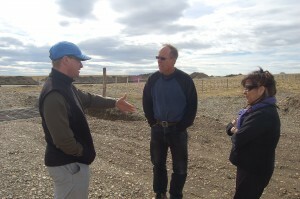 (from left to right) Mike Kaplan and Jay and Barbara Quade. I’ve been to Stewart Island, off the southern tip of New Zealand, but I’m pretty sure this is the furthest south I’ve been. Cool! We’re here in Rio Gallegos. We’ve just rendezvoused with Dr. Jay Quade, a geologist from the University of Arizona, and his wife Barbara. We’ve got two cars, a bunch of boxes of food, and plenty of gear; hopefully we’re ready for eight days in the field. Tomorrow, we’re going to drive across Patagonia toward some lakes at the eastern foot of the Andes. Mike is a glacial geologist based at Lamont. 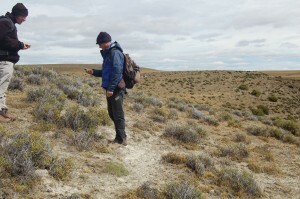 Much of his research has focused on figuring out when the Andean ice sheets, which today are nestled in the highlands and only poke toes out toward the Patagonian plains, grew and shrank. When they grew, they extended incredible distances out of the Andes. When they shrank, they left behind moraines, tills, and tons of ground-up rock. Mike wants to know if these glaciers grew at the same time as the northern hemisphere glaciers. When New York was covered in ice, was Patagonia? Are the Southern and Northern hemispheres glaciating in or out of phase? Jay is an expert on paleolakes. He’s also interested in reconstructing the history of the South America’s climate. He can tell when a lake was high, in the past, and if he can date that high, he can infer something about the climate system that existed at that time. We’re headed to Lago Potrok Aike and Lago Cardiel, which are both special and strange. They’re closed-basin lakes, with no outlets, fed by rivers and streams unconnected to the glaciers that feed most of the lakes around them. 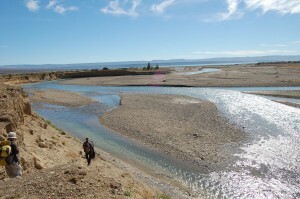 Therefore, the water level is controlled almost entirely by rainfall (and seasonal snowmelt) in the surrounding watershed, with some influence from surface evaporation. The lakes are therefore sensitive recorders of the climate system. You can’t find a much more straightforward natural system than these closed-basin lakes! I’m tagging along with these guys to get samples for my master’s research project. I’m hoping to find dust that was deposited roughly at the time that the last ice age hit its peak, about 20,000 years ago. I’ll explain more tomorrow, but for now, I hope I’ve piqued your curiosity. Dust: way more exciting than you ever would have thought! Ale Borunda. Credit: Mike Kaplan. 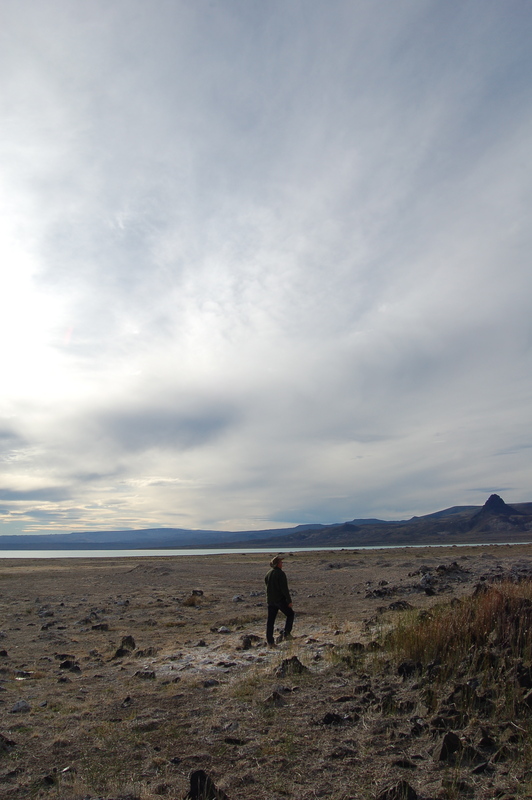 I am on my way to Patagonia with Michael Kaplan, a researcher at Lamont who is part of my master’s committee. We’re here to study how climate in South America was in the past. One reason I’m interested in paleoclimate research is because I’d like to understand our modern climate system better, and what the future might look like. “Climate,” by definition, operates on a time scale longer than seasons or even years, so this wet summer is just another point in some larger dataset, but it’s interesting nonetheless. We get to the small intra-national airport and drop off our bags with time enough to wander down the riverside walkway outside the airport. It’s sweltering and steamy, but Mike tells me that when we get to Rio Gallegos, just north of Tierra del Fuego, I’ll be glad I brought warm clothes. Tomorrow I’ll explain our exact plan. For now, I’m going to make sure that I get a window seat so I can look at the topography beneath us as we fly nearly directly south. To Patagonia we go!